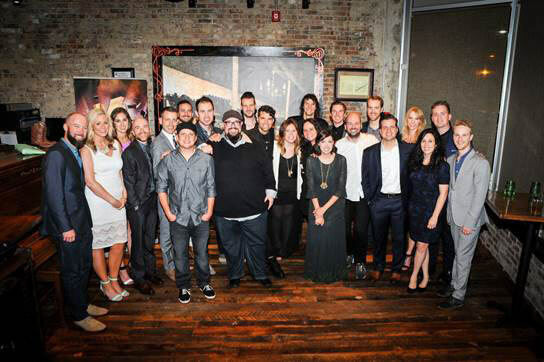 for KING & COUNTRY's Joel and Luke Smallbone; Francesca Battistelli; Big Daddy Weave's Mike Weaver, Jeremy Redmon, Brian Beihl, and Joe Shirk; along with Word Entertainment President & CEO Rod Riley, Word Entertainment SVP A&R Josh Bailey, and Word Entertainment VP National Promotion Andrea Kleid and team at the K-LOVE Fan Awards after party on Sunday, May 31, 2015. NASHVILLE, Tenn. - (June 1, 2015) - Word Entertainment celebrated big at Sunday night's K-Love Fan Awards, taking home an impressive five awards along with artist performances and presenting slots throughout the evening. Top honors went to for KING & COUNTRY who took home the coveted Artist of the Year award, as well as trophies for Best Live Show and Group/Duo of the Year. Francesca Battistelli was named Female Artist of the Year while Big Daddy Weave, who recently celebrated their fourth No. 1 radio song from their album Love Come To Life, was chosen by fans to adorn three million 7-UP soda cans this summer with the Artist to Appear on a Can Award presented by Pepsi. "We are thrilled that fans have recognized Francesca Battistelli, for KING & COUNTRY and Big Daddy Weave for their music, message and accomplishments," Word CEO & President Rod Riley said. "The Word family is proud of all of our artists and their tireless dedication to all that they do." for KING & COUNTRY earned a standing ovation with their performance of "Run Wild," featuring Christian rapper KB. The Grammy Award-winning duo, comprised of Australian brothers Joel and Luke Smallbone, are now the winningest artists in the three-year history of the fan voted awards with four wins taking home Breakthrough Artist of the Year at the inaugural event only two years ago. One of the genre's most celebrated artists, Battistelli, performed her poignant third single "Holy Spirit," from her current album, If We're Honest, which has already yielded the back-to-back # 1 singles, "He Knows My Name," and "Write Your Story." Sidewalk Prophets performed new song "Prodigal" and Blanca presented Worship Song of the Year. The K-LOVE Awards celebrate and promote artists, athletes, authors and entertainers who engage and impact popular culture for Jesus Christ. The faith-based network plays encouraging modern Christian music that reaches more than 14 million listeners a week in 47 markets from coast to coast. Hundreds of thousands of fans voted for the award winners. For more information about Word Label Group and its artists, visit www.WordEntertainment.com and follow @WordLabelGroup on Twitter. A leader in the music industry for more than 60 years, Word Entertainment, a Warner/Curb company, is a unique, comprehensive faith-based company comprised of multi-faceted artist service departments, including publishing, merchandising, booking and online initiatives. Word Entertainment represents some of the top names and brands in music, including About A Mile, Meredith Andrews, Chris August, Francesca Battistelli, Big Daddy Weave, Blanca, Jason Castro, Everfound, Family Force 5, Jon Foreman, for KING & COUNTRY, Group 1 Crew, Love & The Outcome, Dara Maclean, NEEDTOBREATHE, Point of Grace, Sidewalk Prophets, Skillet, Stars Go Dim, Switchfoot, VERIDIA, We Are Messengers, We As Human and Zealand Worship, and is home to 25 Entertainment, Word Distribution (representing Curb Records and Big Idea/VeggieTales among others), Word Church Resources, Word Films, Word Music Publishing and Word Label Group's Word Records, Word Worship and Fervent Records. For more info on Francesca Battistelli visit the JFH Artists Database. For more info on For King & Country visit the JFH Artists Database.